We are seeing my little sister (well, 29 year old, little sister) off to Paris this evening. I have very mixed emotions about this. I'm excited and proud of her doing this for 3-6 months, but yet, so sad that I won't be seeing and texting her on a daily basis. Knowing she's not here, is not easy. My oldest sister has lived in New York for about 10 years, I can't handle another sister moving away. For the next few months, I will be the favorite aunt (only present aunt) to my niece and nephew. I get them all to myself, wink, wink. I will give you all more details on my sister's move later one...it's exciting. 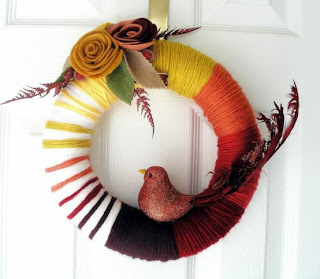 I'm hoping to distract myself by making a new fall wreath this weekend. Maybe something slightly as cute as this one. For now, I hope you have a wonderful weekend. I love that wreath! I hope you're hanging in there without your sister. Sisters are the best!